In Fable: TLC we had the foundations of the Heroes Guild and the story of a hero coming to power to rule over Albion (some would say with an iron fist if what he did to the Guildmaster is to be believed). In Fable II we jumped forwards many years to a time where the old ways were pushed to the fringes and industry and progression took over from fantasy and the wild. Fable III took this a step further with the world being plunged into a full on industrial struggle. Despite the end game options (which I won't spoil) there were plenty of factories still open, and the progress of the world and invention will not be stopped. Seeing as progression is inevitable in any world, it seems wrong for the game to suddenly take a step backwards and look towards the beginning like a few people want. This also goes against the design philosophy of Lionhead Studios with them not wanting to make another swords & sorcery style game. 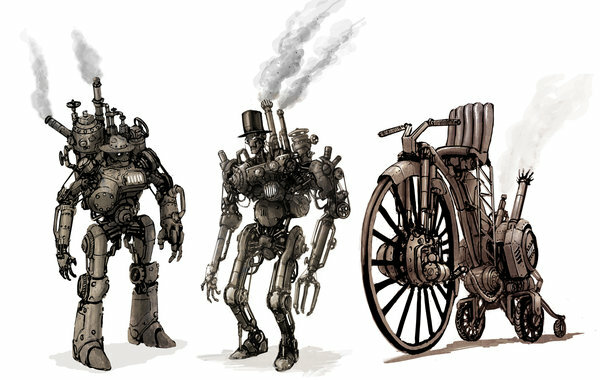 The logical next step would either be a large leap forwards towards maybe the modern day (think in the same way that Assassins Creed puts the mechanics of the historical gameplay into the modern world) or a small leap to a proper, full on steampunk period in Albions history. Now, how would this work I hear you say? Well, like the Industrial Knight armour showed this would be entirely possible if technology has got to that point already with Reaver Industries. Fantasy & the Modern History feeling can always overlap and could easily sit quite well next too each other. Lionhead have always looked to films for inspiration it seems with their games, especially the second two in the franchise. Fable II drew heavily from the look and feel of films like Brotherhood of the Wolf (very good french film) and Sleepy Hollow. Fable III seems to draw from the very classic Sharpe series and so it would seem right to look at what media offerings could inspire a full on steampunk Fable IV. Here again is another good mixture of the fantasy and steampunk for us to look at for justification on our onward journey. Again it has the powerful dark and fantasy influence from beasties but also, and more importantly the human influence which could be a big thing in coming games. With the growth of technology, there will be those that try and use this for evil as well as good. In this its Moriarty/Fantom who is trying to create an army like Mr Hyde. Could this be something Lionhead could use? Maybe with the advent of the Gauntlet to channel Will everyone could have access too this powerful source of energy and some humans in Albion have been bending it too their nefarious will causing all kinds of horrible mutations and odd powers amongst the populace (or their experiments). 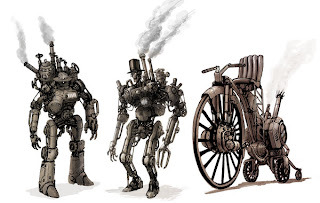 Vehicles have never been something implemented in Fable games, and again this kind of setting would need none, but like Fable III they could still have a presence. Maybe, like Fantom the crackpot trying to bring down the world has an army of blimps at his command? 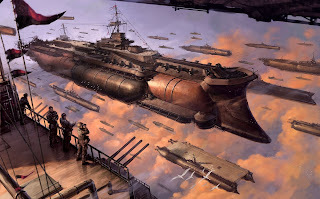 Maybe an Auroran scientist has come up with a perfect way to travel over and under water like Captain Nemo? Now this is a big leap in time, but bear with me. Now, this isn't technically steampunk but its a very good way of showing the power of the fantasy world mixing with the urban and the modern. Maybe as Albion has become more technologically advanced the fantasy world has been pushed underground? Like in Hellboy a whole world of fantasy exists along side the human world, just out of sight in the fringes. Maybe this is where the balverines and hobbes have gone? The people of Albion could see the stories of Balverine attacks, Hobbes stealing children and such as old wives tales told to scare the children at night, or the symptoms of madness in the old. Hobbes could rule the shadowy sewers of the steampunked world, balverines skulking in the dark forests no one enters anymore, or in plain sight like the guests of Reavers party...something to think about there. But now onto the powers the heroes in Hellboy possess. Just like Fable there is Will there, uncontrollable at first with the young woman in the films but then later channelled for good. 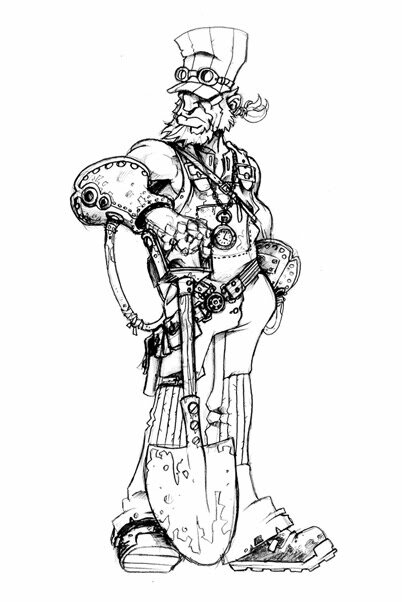 Hellboy himself is a being of strength, and there are even firearms wielded by the group as well. Maybe like in the previous example Will has become something uncontrollable and prone to violence and that's why Gauntlets are needed. Either way, this film shows a brilliant way of the fantastical being put alongside the modern progressive world. There's even an 'Old Kingdom' beneath the world with Prince Nuada and the Golden Army...which could almost be the mechanical constructs of the sandy dunes of Aurora. At the end of the game we now know what the real threat to Albion was all along. We hear why Logan did what he did, and why Teresa needed you to make the ending possible, to save Albion. It seemed as if this 'evil' was powered and given strength by fear and sadness which means maybe it will never fully go away. With your hero 'finishing' off the threat in the end of Fable III the future could be very interesting for the world of Albion. It seemed as if the power was locked away within the continent of Aurora but now is free...and the continent itself is also a lot bigger than the areas we have discovered in the game. Whatever it was, is possibly biding its time until it can once more return to bring Albion, and Aurora down to its knees....and make servants of all its people. In Fable IV then, if we go down the steampunked route, what could the possible story be? Maybe we will find out that Teresa has not been totally forward with the truth once more and the darkness is returning? Maybe the Spire still has a part to play? Maybe she is waiting for the right time, and the right technology to harness the power of the Spire for some other purpose? Maybe the story won't be focused on Teresa at all? What if the main story focused on someone else, a hero amongst the people who was subject to the experiments of the villain of the piece and has to find out who he/she is and channel their power, for good or evil...in defeating the man who had tormented them. Could the hero find solace in the dark corners of the world of Albion and unleash the dark creatures of the woods and caves back on the people of the cities? The need to 'not save the world' would be a good opportunity to play on the opposing moralities and let the player truly be good or evil. This is just a few ideas...maybe it could give a few people a bit of hope that a forward looking and technological/steampunked Albion could be a good idea. I hope to carry this on in another post at some time to keep you updated with my ideas. Great ideas man. Love them, and I'm looking forward to F4. Fable 3 was awful. I'm not even gonna watch a trailer for fable 4. These games are getting progressively worse. Peter molyneux is a greedy pig. He just wants to make half the game then sell the other half as dlc. Quit worshipping his awful story. The first game had an amazing story. The second one sucked but it was decent compared to the third. There was so much potential. The gameplay is still solid. That's the only reason I haven't shattered the disc and flushed it. Each to their own Dizmas, each to their own. Fable has, and always will be, one of my favourite game series and I hope that (with the new community initiative) with Lionhead the fans can build something that we can truly enjoy. There are some great parts to Fable III's story and my review covers that I think. I expect you've seen the movie Van Helsing. But have you also seen the animated prequel Van Helsing: the London Assignment and the comic Van Helsing: From Beneath the Rue Morgue. They both have lot's of dark elements that would really fit the into Fable. It's a bit difficult to get you're hands on the animated movie and the comic book. So if you're interested in seeing them, let me know. Got the torrent for the movie and the comic as pdf on my pc. Have you also seen Vidocq and Howl's Moving Castle? Vidocq takes place in industrial paris and has gothic fantasy elements. A nice movie with a wonderfull dark atmosfere and a interesting plot-twist. Howl's moving castle takes place in realistic Victorian and Industrialised England, yet there are wizards and witches as well as steampunk vehicles. After seeing this movie i think Fable won't have to lose it's magic whilst moving forward in time. Info on new DLC: 23rd November for Understone!